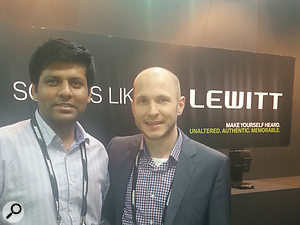 Suchit Ahuja (Beatbox Entertainment) & Roman Perschon (Lewitt)The Vienna-based microphone company Lewitt has officially launched its presence in India at Palm Expo, Mumbai, by appointing M/s.Beatbox Entertainment Pvt Ltd as its exclusive distributor in India. Here at SOS we've reviewed a few Lewitt mics over the last couple of years (http://sosm.ag/search-lewitt) and they've always offered something a bit different, for example the hybrid valve/solid-state LCT940 and the DTP640 REX dual-element bass drum mic. Lewitt create modern, high-performance tools designed to capture every sonic detail. The company has dedicated itself to supporting music aficionados, artists and audio engineers around the globe in getting the best out of every single creative idea and every project — with microphones that set new standards in terms of sound quality, technology and reliability. CEO Mr Roman Perschon is very excited that Lewitt now has a presence in India and is confident that M/s.Beatbox has the right network and team to make his brand a success.